MoMA Librarian David Senior interviewed by ARTBOOK intern Madeline Weisburg on how Artists' Books have entered the Library of the Museum of Modern Art and how new online publications are being archived. "The MoMA collection makes clear how you can trace all the different avant-garde movements and then subsequent conceptual movements throughout the twentieth century through little publications. They were sort of the first shot across the bow, for artists trying to develop new ideas. Especially for people working collectively, who might use the magazine as a way to coalesce a group of people under a label of a movement or just a working practice," says David Senior. Madeline Weisburg: Can you tell us how you became a librarian and how your interest in artists’ publications evolved? David Senior: I worked in libraries out of college, just as a place to get a job, and that was sort of a productive space to do my own research. I always joke that libraries aren’t just for storing books but also for people who would have a hard time getting a job anywhere else. So that was how I fell into it. I always had a romantic relation with the idea of special libraries that held rare books and stuff like that. So in college I worked in college libraries and right after college I started working at the Newbury Library in Chicago, which is an independent humanities library that has old rare books and maps. And that was my original relation to libraries, was working with older materials. It wasn’t until I started working here [MoMA] where it was more a focus on contemporary or modern things. The library practice happened alongside an interest in contemporary art and being amongst a community of friends that were making stuff. So the MoMA job brought together always having a job in libraries and also having some sort of curatorial or academic relation to theory and contemporary art. MW: Very little seems to exist on the topic of artists’ magazines. Often it is a sub-topic or a sub-sub topic within the study of a specific movement (conceptualism, etc). Do you feel that the study of artists’ magazines—as opposed to artists’ books—is increasing or growing or evolving in an academic context? DS: That is one way to trace especially conceptual practices that started in the 50s and 60s, and into the present where you have artists that are working collaboratively or using the title of a magazine to stand behind their own conceptual practices. And there have been larger books—Gwen Allen’s book Artist's Magazines for example, and an exhibition called In Numbers in New York City that traveled to London and then was a big catalogue published by JRP. Part of the work that organizations like Primary Information do, republishing or re-editioning these types of publications, has generated more awareness, recirculating them in such a way that they’re not a rare object, they’re something that people can acquire. MW: There seems to be some specializing in the collecting of artists’ publications. Barnard and Wellesley for example have specific zine libraries. Do you have any thoughts on this specialization in specific aspects of independent publishing? DS: I think it’s really exciting. I mean, all it takes is one person who has an interest in specialization, who is working in a library, to create a repository for things that might be ephemeral or escape the public record. So those zines libraries are really interesting. For us, and other institutions in the city like the Brooklyn Museum Library or NYPL, we have collected artists’ publications at different levels over a course of time. For MoMA, it has been since around the mid-70s to the present, when places like Franklin Furnace and Printed Matter started. MoMA library had a developed relationship with those places at the time, and Clive Phillpot, the librarian who was collecting for MoMA, was very present at the beginning of what you could say was the artists’ books movement, identifying the artists’ book as a cheap democratic multiple. 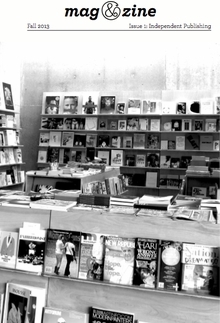 That was when the discrete collection of artists' books emerged in MoMA’s library. But the Museum always had a very extensive collection of avant-garde publications that now we would call artists’ books—like Dada publications or Surrealists publications that look, smell, feel like a zine or an artists’ book, but it was Duchamp’s zine. It was a different time, but with the same sensibility of direct dissemination of ideas, and having a practice through publishing. The MoMA collection makes clear how you can trace all the different avant-garde movements and then subsequent conceptual movements throughout the twentieth century through little publications. They were sort of the first shot across the bow, for artists trying to develop new ideas. Especially for people working collectively, who might use the magazine as a way to coalesce a group of people under a label of a movement or just a working practice. MW: The definition of an artists’ book has been endlessly debated, without any conclusion. How does MoMA library define for itself what is an artists’ book or artists’ publication that should belong in the library, as opposed to editions and multiples that belong in the prints and drawings department? DS: That’s a really good question, and something that is a moving target in a lot of ways. There are a lot of publications that are in our collection in the library, and in the prints and drawings collection, and in the archive. So there are two or three answers for the same object. The big archive of Fluxus material that came to the Museum a few years ago has been the current example of what I think about when we discuss how things are placed in different collections. It was often an object-by-object decision, between people in the curatorial departments, the Museum archive, and the library. In the past our library collection focused on artists’ books that fell within the idea of a cheap democratic multiple, so there was an idea that if a book was made an edition of over 100 or something like that, then it became a library collected artists’ book. So that would be if the intention was for distribution and not as a scarce printed object. Sometimes that was one of the definitions of what went into the print department and what went here. So if it was a small edition of ten, or a deluxe edition book, maybe it was more appropriate in the print department than here. But there are a lot of exceptions to that within the existing collection and things we collect from artists now. One of the fun parts about my job is to meet directly with artists who actually make this stuff. I work at cultivating collections of individual artist’s work and published materials. Some things are well distributed and some things are less well distributed, but I still add it to the collection. MW: When you see a new publication how do you know you might want to collect it, or why it would be of value in the MoMA collection? DS: Yes, it is interesting, the difference between what I do and curating. The general mandate is to document what’s happening, so even if I’m not compelled by a particular book we still collect it. Or vice versa: there are some things that I would like to add but maybe it doesn’t quite fit what we do. Like if it’s a unique object or something like that. But I work with places like Printed Matter or places in Europe that distribute books and just keep up with what’s coming through those outlets. There are some decisions I make that could be considered curatorial, but in general it’s more about documenting what’s happening, within the boundaries of the budget that we have. MW: So it’s about being a resource that curators can pull from later. DS: Exactly. And being a repository for these types of efforts. It’s not about what I choose but what others can choose from in the future. MW: What is the MoMA library’s stance on ephemera? DS: From the beginning there were always scrapbooks, collected clippings and little show flyers, and stuff like that. So there’s a really great collection of Surrealist and Dadaist ephemera here. And then there has always been an artists’ file program in the library, for announcement cards and things that get mailed. Those all get added to the artists’ files. So there is a really huge collection and that’s kept in Queens. There are also subject files that we don’t keep as up to date now—gallery folders and stuff like that. There are some really amazing posters that are not necessarily cataloged, they're just sort of in the files. MW: How does the MoMA library present its collection online? Certain things within the museum have been digitized, like the museum press releases or materials relating to the museum and its history. But we haven’t been digitizing artists’ books as much. That is always seemingly on the horizon. Things get photographed when they are in exhibitions and there is an existing database of those images. We have a Tumblr. I made a Tumblr for the most recent show that we did of things from our artist files. But the Tumblr has become a really interesting avenue for getting things seen. It’s really popular, we have 160,000 followers. DS: So it’s an attempt at having another way of showing what is here. And it’s a little bit of a marketing strategy for the use of the collection. One of the priorities for a lot of the people that work with the collection as reference librarians, cataloguers, administrators within the library is for the collection to get used. It’s a little different from an archive in that way. Librarians are interested in access. Within the context of the museum it’s important for people to think that we’re approachable. This is a space of research and the public can use it. That’s something we try to do with small things like the Tumblr or having events here after-hours for artists to present their books. MW: Is the library making any effort to archive publications that are only based online? How does this work? DS: Yes. The short answer is that we just catalogue it like other publications and also provide a link out to the publication. The longer answer that is still being played out is that we are working on a grant-funded project to archive websites, like artists’ publications or artists’ websites or even MoMA’s website, to make sure that each iteration of it is archived. That is what a lot of discussion about the next kind of library is—how to archive internet resources and stuff like that. Not to just link out, but to have a standing record of the different iterations, because things change. Especially an artist’s website, because it becomes a different thing over time. Non-profit spaces are another area of resources that seems really necessary to capture in some way over time. MW: Are there any specific websites that you are thinking of? DS: Sure, like any non-profit that runs on a shoestring and then doesn’t have the means to archive it. A place like Printed Matter for example, with a site in constant flux. They don’t have the resources to do it themselves. Any alternative space would be interesting to archive. That could be something we could provide. MW: In the last few years the MoMA Library has moved from being archival to activating artist publications with exhibitions, talks and conferences. Could you tell me about this kind of programming, particularly the 2012 Millennium Magazine show? DS: It’s clear that exhibitions can be a public face for the collection. Rachael Morrison and I did the Millennium Magazines show. We’ve consistently had shows of historical material. That show seemed a little different, though, and another kind of challenge, because it was showing contemporary stuff, and that was something that I hadn’t done and we hadn’t done in that space before. It was a huge amount of work, but also it was interesting to coalesce a large group of people that were making these types of works and tell them about what we’re doing and have them send us copies. So the communication that we had while organizing it was beneficial to me and to Rachel, who also collects magazines, to even get a better sense of the scene. Everybody told their friends who work in publications, and publications usually involve large groups of people, so the word spread pretty organically. MW: What was the research process like for planning that kind of show? DS: A part of our jobs is to keep up on this type of thing. So we had a working list of who to invite. And anytime you present a large list of titles, you’re always going to miss some. So afterwards it was pretty useful because people pointed out what we could have added, so we would keep track of that title as well and add it to the library. So once people even knew that we collected that sort of thing, we got more solicitations and contributions to the collection. That’s an example of presenting another face of the library and people recognizing it as a repository and a resource, and wanting to add to it. MW: So what kind of publications did you exhibit? What were you looking for in terms of showing the public what's happening in the field now? DS: It was really hard to know where to set limits. Generally we set the boundaries to what we collect here, so, as with anything in the library, we operated under the same scope as the museum itself. So film and performance, architecture and design, and then contemporary and modern art, sculpture and drawing, photograph, prints… and there are always the funny outliers. But the most general rule was publications that have self-directed production—an editorial team that was completely on their own terms, not being published by someone else or a self-generated project. That was how we delineated a lot of the structure of the show—things we can say are artists’ magazines or designers’ magazines, things that were self-produced or self-published. MW: Many artists making magazines in the 60s and 70s were drawn to the medium because of its purported low cost, accessibility, and potential for distribution. Can you reflect on the current wave of artists’ publications versus earlier waves from the 60s on, in terms of modes of production, distribution, and accessibility? DS: I think a lot of the intentions and motivations are similar. Like having the book as a project space to have a public practice. There is a clear lineage there. Then there is also the question of still using that media. Still using printed media while there are alternative media to use. Obviously, digital is the big thing—the elephant in the room whenever you talk about alternative publishing. That’s a question I don’t have a clear answer for, but with younger artists who are printing and publishing, there is some relation to their web life, like gathering and printing images found online. There is a call and response to the web-media language and the print media language. And there are things that you can do in either that make it really more of a design question. Some people prefer the look and feel of a printed object, so I think that’s part of it too—people trying to solve a problem and arriving at the design solution of making a book. Because it is obviously a very simple and discrete container and that solves some design questions about how to present work. Appreciating how thing appear sequentially and so on. MW: Right, certain media just work better for certain concepts. DS: Yeah, and there have been lots of different examples. Like photos and books—it’s kind of a happy marriage. Photo books have been a very specific niche for a while and there is just something that works design-wise. An interesting thing that also happens is the way we can advertise and communicate the availability of new publications. I can find out about a publication in Oslo very easily because of a website. That has sped up the distribution. That’s interesting too about the popularity and the knowledge of some little publishing projects around the world: it’s made feasible through websites. So that’s a funny catch with this new printing phenomenon. The community is something that’s linked up by websites. MW: Yes, speaking of communities, you’ve been actively involved in organizing events for the New York Art Book Fair for some years. With its ever-growing number of participants and programming, I’m wondering how you see the New York Art Book Fair and other independent book fairs playing out for artists, and also in terms of critical dialogue within the field. DS: Since I’ve been involved with it and since it’s been at PS1, the common response from participants is that it’s an interesting way for the community of people who are doing this sort of thing to see it all. All the different aspects of it, including the antiquarian, not just the new artists. Having these really interesting dealers of rare things in connection with the new material sets a whole landscape for this kind of object. I don’t think Printed Matter, and subsequently PS1, when they agreed to host it, knew it would be as popular as it has become. A huge number of people come every day to the fair. That’s another question I don’t have a good answer for, why so many people come. It’s exciting to be a part of. Something that comes up, but maybe lacks a good solution, is how to generate a public discussion about things that are published in the same way that art gets reviewed. There’s a website called Paperweight that started a year or so ago, with this idea to foster some critical discussion about visual books, and a photo book review that Aperture started. There isn’t a lot of critical dialogue, though. There is a lot of research or writing about individual projects, but a more overarching history doesn’t really exist. I think Gwen Allen’s book has been popular because it filled a certain niche in terms of how to discuss these things. MW: Right, because instead of talking about one specific publication or movement, she’s mapping a history and drawing connections. DS: Right, and linking it within a very specific moment. There was an extended idea of these publishing practices as a new medium, as a new way to broadcast alongside early video practices and the alternative spaces that were popping up. The book was another part of that. So her account of artists’ magazines as another new media practice captures that specific moment in the mid 60s to the 70s. is Bibliographer at The Museum of Modern Art Library. He manages the selection of materials for the artists’ books collection at the MoMA's Library as well as collection development of the general holdings. Recent exhibitions organized by Senior include Millennium Magazines (2012), an exhibition of contemporary artists' magazines and Please Come to the Show (2013), a two-part exhibition of special invitation cards and event flyers from the Library's ephemera collections. 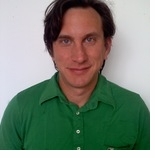 He has been published in Frieze, Bulletins of the Serving Library, A Prior and C Magazine. He has also published an artist's book series through Printed Matter, including publications by Dexter Sinister, David Horvitz, Emily Roysdon, Aaron Flint Jamison, Triin Tamm and Eve Fowler.